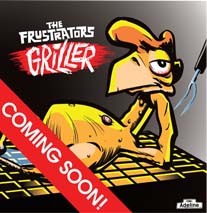 Mike Dirnt's side band, The Frustrators, will be coming out with a new EP in the middle of February entitled, Griller. Griller will be released in four different formats. Each version of the album will be released on a different day. The CD version will be released on February 15th from Adeline Records, and the MP3 version will be available on February 22nd from Adeline Records. The vinyl version currently does not have a release date and it will be released on Doctor Strange Records. You can read all of the posts we have made leading up to the release of The Frustrators EP by clicking here. UPDATE: You can preorder Griller from Adeline Records for $6.00 by clicking here. New Poll: What Green Day album has the best artwork?